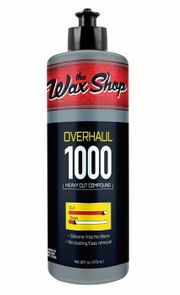 Home > The Wax Shop Car Care Products > Wax Shop Overhaul 1000 Compound > Wax Shop Overhaul 1000 Compound - 32 oz. 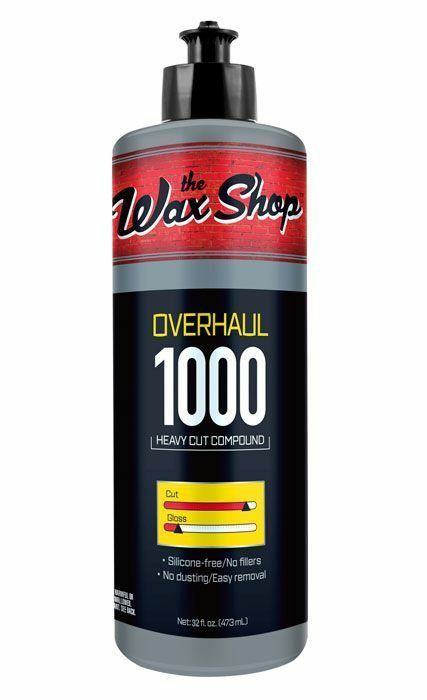 Wax Shop Overhaul 1000 Compound - 32 oz. OVERHAUL’s blend of high-quality heavy cut abrasives and lubrication technologies efficiently corrects up to 1200 grit paint imperfections. Its body shop-safe formula leaves no powdery residue and is effortless to remove. Apply 3-4 dime sized drops evenly spaced on the appropriate foam pad. Use treated pad to dab a 2 ft. x 2 ft. area of your paint. Turn on machine and apply light to medium pressure in a cross-hatch pattern – up and down motion first, then side to side. Use appropriate speed and pad for the type of polisher being used. Remove immediately with a microfiber towel. SONAX CutMax Cutting Compound 250 ml.